We call this onion thattai back home as udumalpettai thattai. This is a family favorite and loved by everyone at home. 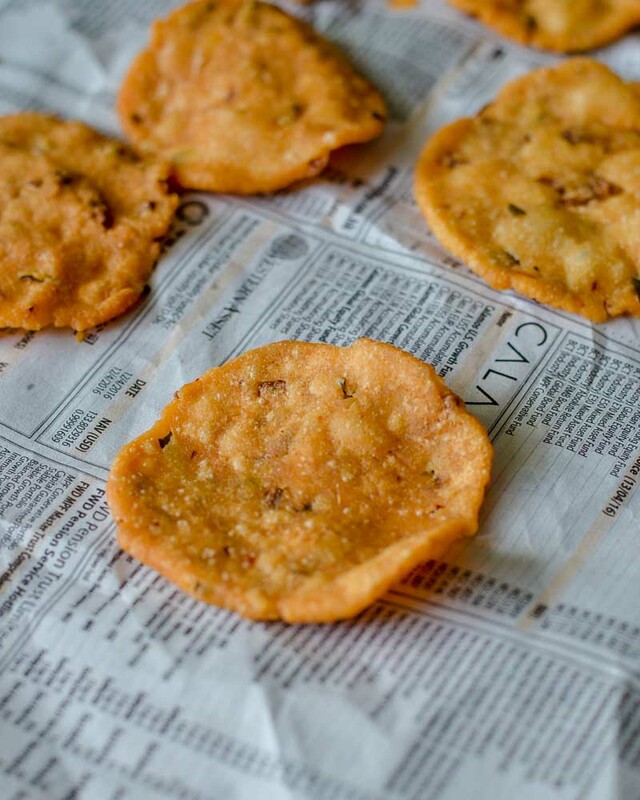 If the normal thattai and onion pakoda married together, the result would be this amazing onion thattai murukku or thattu vadai as its called at our place. Its incredibly crispy and very tasty. 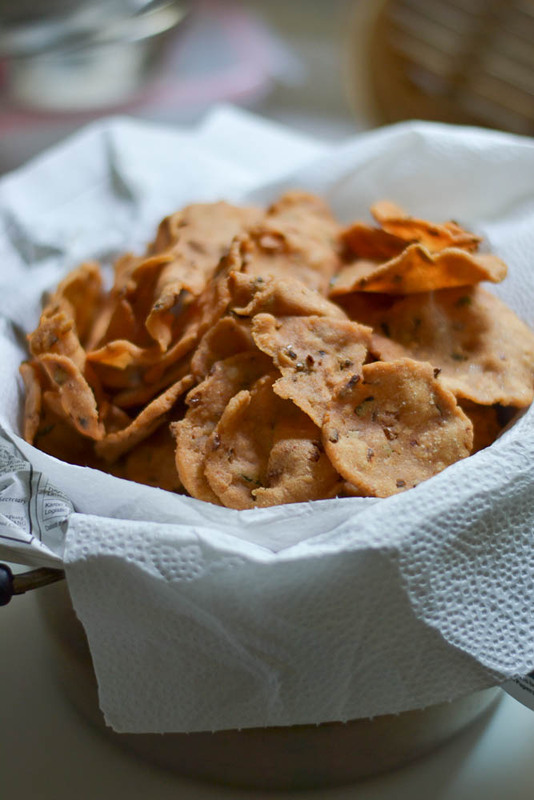 This again is a recipe from the snack queen of the house, Padma Akka (Vinodh’s Sister). Soak the raw rice in water for one hour. After soaking for an hour, drain the water completely and dry the rice by spreading evenly on a cloth for 2 hours. The rice needs to dry in shade. Not under the sun. 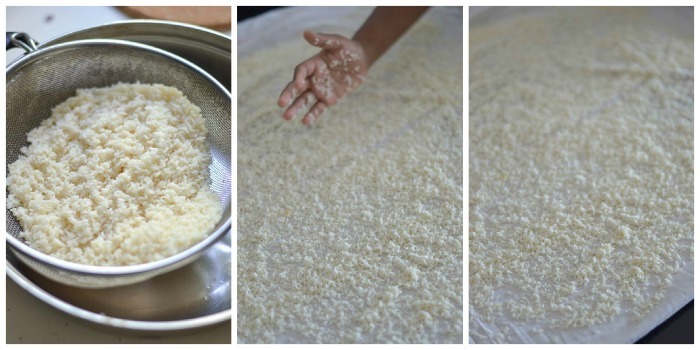 Once the rice is dried and has very little moisture left, grind to a fine powder in a mixie. Usually the rice is ground to a fine powder by giving it in a rice mill. If grinding at home, grind in very small quantities in a mixie until its smooth. If grinding at home, remember that it will be very slightly grainy and not perfectly smooth. Grind as smooth as you can. Once the powder is ready, sieve and set aside. 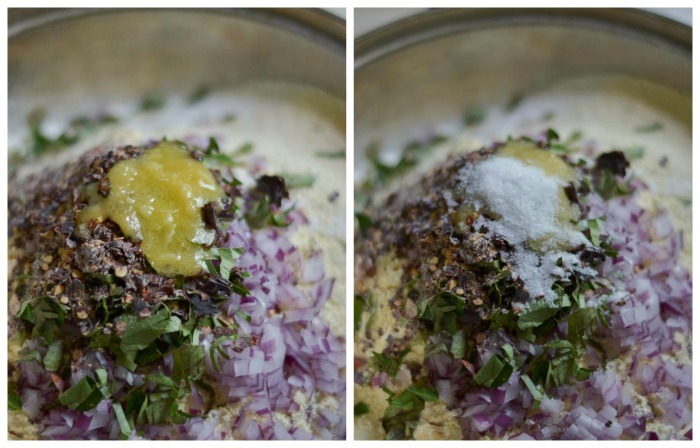 Grind the fried gram dal (pottukadalai in tamil) – also called as the chutney dal to a fine powder. Sieve on top of the ground rice flour. Set aside. Add in a cup of chopped onion and chopped curry leaves. 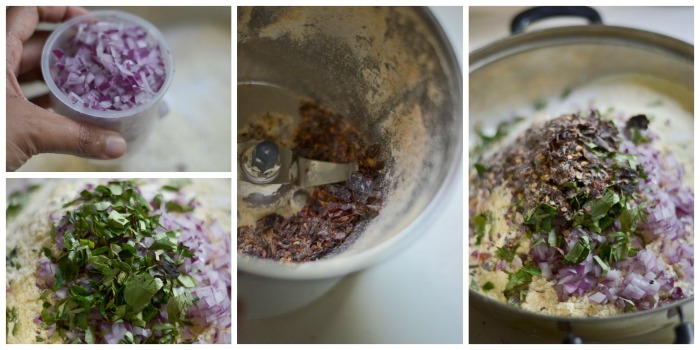 Grind the dried red chillies to big flakes in a mixie and add it to the bowl. Add in the ghee and the salt. 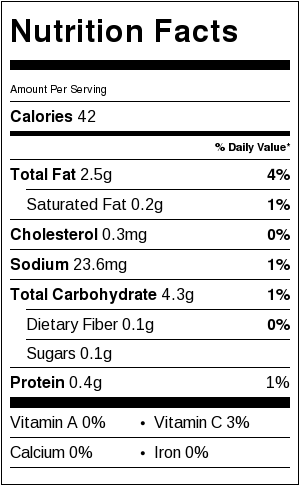 Add 125 ml of water to begin with. Mix well to form a pliable dough. 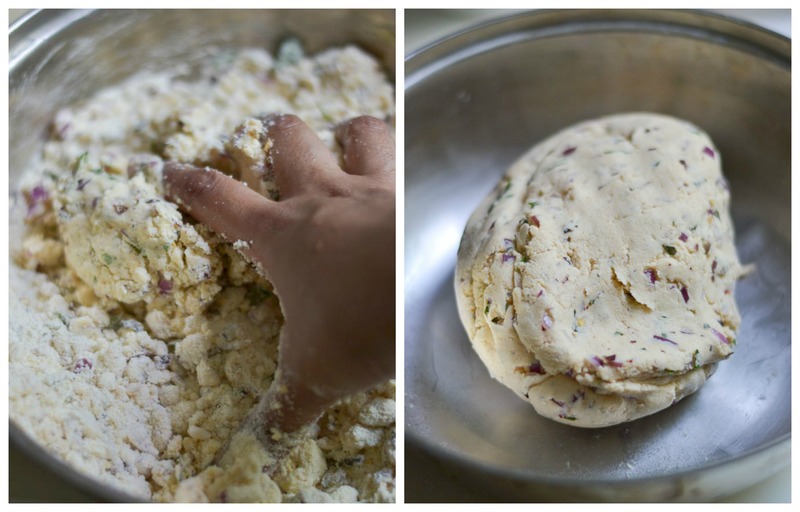 If the dough is very dry, add in a tablespoon of water at a time and mix. Don’t be tempted to add a lot of water. We need a tight dough. Don’t make the dough very soft. It might become messy when shaping them into thattai, and will consume a lot of oil. Set aside. Let the dough rest for half an hour before frying. Take a big marble size piece of dough and spread it on a plastic wrap with your hands to form a circle. The circle need not be perfect. The edges might crack a little and that’s fine. If its really difficult to spread, and the dough is cracking a lot, add a tablespoon of water to the dough to make it a little soft. But use caution not to mess up the dough. Get 5-6 thattais ready on the plastic wrap before you start frying. Heat oil in a pan until hot. Gently remove the spread dough from the plastic wrap and place it in oil. Gently turn the thattai after 40 seconds. Wait for it to be golden and the bubbles in oil to have considerably subsided. Remove and drain on paper towels. Repeat with the remaining dough. Tips for making thattai: If the murukku is hard to the bite, add in a teaspoon of ghee to the dough and mix well. Fat makes the murukku softer. Don’t add a lot of ghee. The murukkus will lose its crispiness and will turn out to be softer. Add ghee only if really necessary. If the dough is really dry, then add in a tablespoon of water to make it pliable. Murukku making is a very patient process. This recipe for thattai murukku took about an hour to fry. I fried 5 thattais at one time. You can fry more in a bigger pan if you want to speed up the frying. Store the onion thattai murukku in a paper lined air tight box for up-to 10 days. It has never lasted that long at my place. Recipe for thattai murukku. Thattai vadai recipe made Tamilnadu Kongunad style with rice. 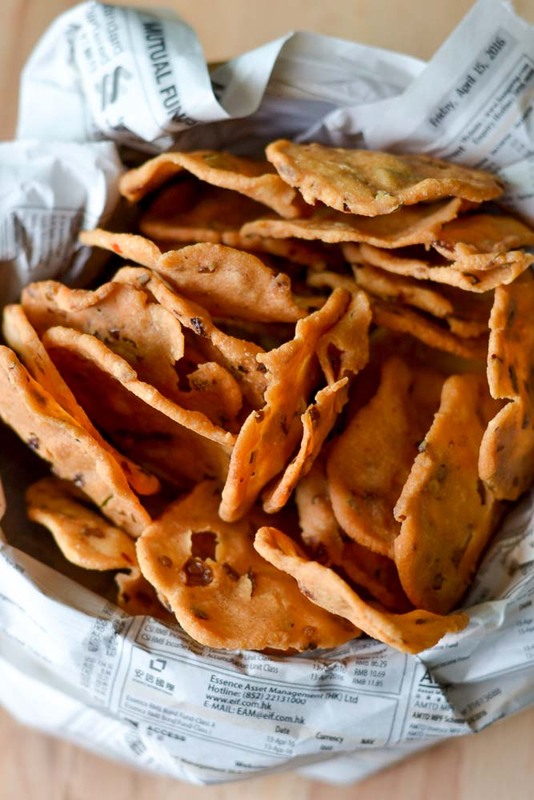 Onion Thattai recipe with step by step pictures. Soak the raw rice in water for one hour. After soaking for an hour, drain the water completely and dry the rice by spreading evenly on a cloth for 2 hours. Grind to a fine powder in a mixie. Sieve. Grind the fried gram dal to a fine powder. Sieve on top of the ground rice flour. Set aside. Add 125 ml of water to begin with. Mix well to form a pliable dough. 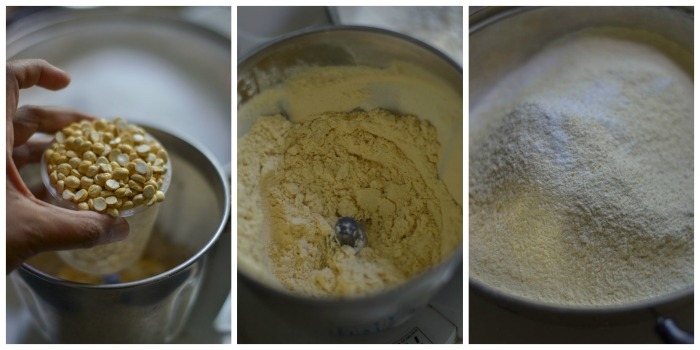 If the dough is very dry, add in a tablespoon of water at a time and mix. Let the dough rest for half an hour before frying. 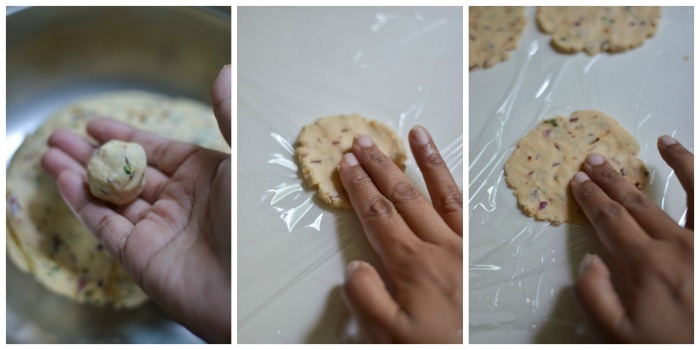 Take a marble size piece of dough and spread it on a plastic wrap with your hands to form a circle. Store the onion thattai murukku in a paper lined air tight box for up-to 10 days. 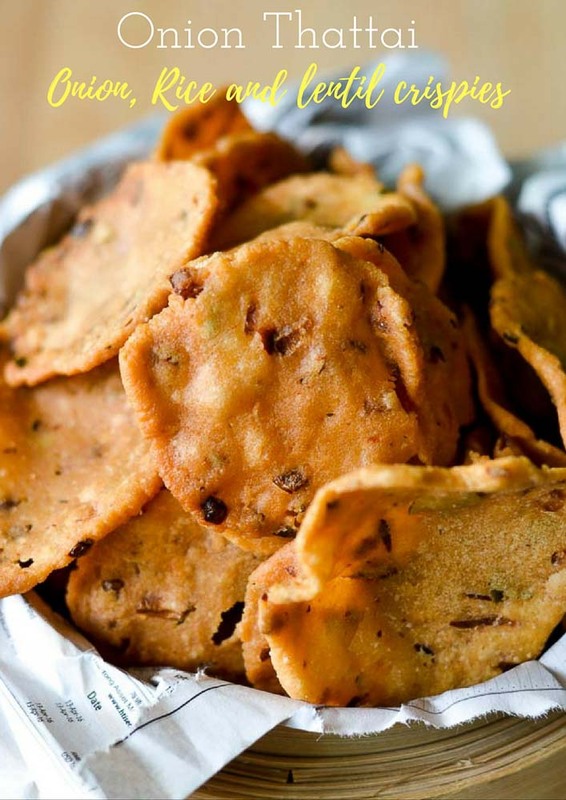 Tips: If the murukku is hard to the bite, add in a teaspoon of ghee to the dough and mix well. Fat makes the murukku softer. Don't add a lot of ghee. The murukkus will lose its crispiness and will turn out to be softer. Add ghee only if really necessary. I tried thattai vadai receipe 6 years back for the first time in my life and it was a great disaster (for our thala Deepavali?). I added more butter thinking the vadai will become crispy but when I drop the dough in the oil, the dough got dissolved completely in the oil and the oil wasn’t in reusable condition. 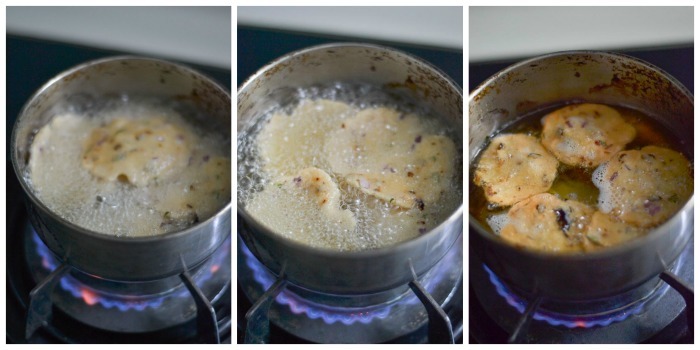 Adding more butter / ghee makes the muruku / vadai very oily and too too much butter /ghee will make the dough dissolve in the oil. As I realized the mistake, it came out very crispy and tasty from second time onwards. My mom makes the rice flour as you said but I normally use the flour that available in indian grocery stores. Adding channa dhal and split peanut/ groundnut enhances the taste of every bite. You are correct Pavithra. Butter quantity is very important while making murukkus. Hi Suguna.all your recipes are very nice.and onion thattai is one i was searching for.thanxs for recipe. 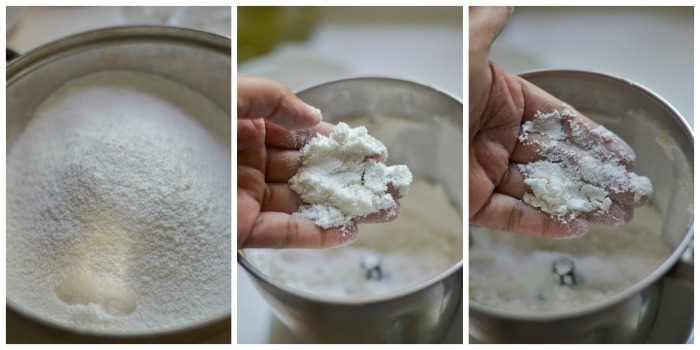 If i use the store bought rice flour does the same measurement work.I live in Canada and we do get rice flour here. hence the doubt. For murukku, we need to use prepared rice flour. Ordinary rice flour may not yield desired results.